'THIRD TERM AGENDA' REVISITED: ANY REGRETS? As all Nigerians, and indeed Africans, know, our leaders are prone to hogging national control and power. One need only look at Mugabe in Zimbabwe for a current example of the 'power for life' attitude that far too often characterizes African 'rule'. Some Americans even rejected Senator McCain's Presidential candidacy on the belief that it would essentially be a third term for former President Bush. Many Nigerians will also recall the brouhaha that ensued once Former President Obasanjo's 'Third Term Agenda' was revealed, and the extremes to which individuals from all sectors of the country fought to prevent it. Today, Nigeria is controlled by President Yar'Adua who apparently received 70% of the vote in an election that was declared flawed. With the second anniversary of his Presidency right around the corner, Yar'Adua faces the usual complaints that every President the world over is confronted with. After all, being the leader of a country undoubtedly makes one the national punching bag. Yet, Yar'Adua faces the reality that increasingly, many point out that there are yet to be any visible signs of progress on the issues he promised to tackle. "I wonder, given what we know now, whether Nigerians would rather have a third-term OBJ in office?" I will admit that this is an interesting question and that I am curious to know what others think. Considering our history of coups and the flagrant abuse of power illustrated by many leaders, I do not believe Presidents should be given too many years to hold onto power in Nigeria. If Nigeria's Constitution allowed for the option of 'recall elections', that would allow the people to remove their President and even other public officials once public dissatisfaction was high, then maybe, I would be amenable to Presidential third terms. For the sake of fairness, I must also point out that Obasanjo had 2 terms (8 years) to achieve such accomplishments like debt relief. Yar'Adua is yet to reach the half way mark of first 4 year term and could possibly surprise every one by the time the next Presidential elections occur in 2011. I definitely hope so. Nevertheless, I wonder what you think about the question posed - would you feel differently about OBJ's 'third term agenda' after 2 years of the Yar'Adua administration? And, why? - Yardy To Get A Third Term? Whilst there might have been some regret about the performance of Yar'Adua, I do not believe that giving Obasanjo a 3rd term would have served our country any better. We need to get away from the idea and hubris of leaders thinking they are the only answer to their country and no one else can do the job. Imagine, America can have a very successful President who runs the full 2 terms but they have to give way to others no matter how less in stature the successor would be. My view is if you cannot change your country in a maximum of 8 years, you probably would not do any better the next 4 - the longer you stay the more it engenders complacency, indifference and distance from the people. The focus then shifts from leading to the leadership itself ingrained with influence peddling, patronage, nepotism and group think. What should matter now is either the ruling party select another man and/or a better electoral commission start to prepare for free and fair new elections in 2011. Yar'Adua must not win a second term, rather a new unknown person for a first term than a known incompetent person for a second. I agree with Akin. We shouldn't act like there's only one person that can do the job. Yar'adua's reign has been a complete joke, but leaving the same person in power for another term is how power-hunger and dictatorship starts. Instead of wishing for the old, we should make a decision that next election, someone else has to step up to the plate. Assuming it isn't rigged to kingdom come that is. Let's stop living in the past. @ Akin: Thanks so much for swinging by! First, I think I was negligent in not clarifying that my friend is not an OBJ supporter, nor is she a Yar'Adua supporter. She simply raiseda question as a joke and I thought it would be good to see what others thought. That being said, I completely agree with you, that "We need to get away from the idea and hubris of leaders thinking they are the only answer to their country and no one else can do the job," is practically an understatement when it comes to politics on the continent. So far, Yardy has done little to convince me that he is worthy of a second term, but I hope to be pleasantly surprised because if he by 2011 we still have nothing positive to say about Yardy, that will be bad for the country. Thanks so much for lending your voice to this conversation. @ Onyeka: Like I said to Akin, I did not mean to give the impression that my friend actually thought the Third term agenda was a good idea. I must update the post to reflect this. "Instead of wishing for the old, we should make a decision that next election, someone else has to step up to the plate. Assuming it isn't rigged to kingdom come that is." I couldn't agree with you more. Nigeria needs to allow room for new and unknown individuals to face the challenge of leadership and allow them to implement new ideas. The issue becomes whether or not 2011 elections will be rigged as well. NEXT is now reporting that Yardy will continue to control INEC, which I find problematic and inconsistent. Given the numerous elections that have been overturned by Nigeria's Courts, Iwu has proven that he is incapable of running INEC and managing any elections of consequence to the people of the Federal Republic. Thanks so much for participating in this discussion. @ Sugabelly: First off, I want to commend you for always voicing your opinion. I took yesterday off only to see that the discussion on Nollywood really got interesting to say the least. Your comment today on the PDP reminds me of similar comments made by my cousins in Lagos. I definitely think that the PDP is fat off the 'success' of 'elections'. As such, the party is yet to truly provide results overall. Many of their governors have lost their seats due to rigging, as well. Anyway, it is time for "new blood" and particularly new approaches to dealing with Nigeria's problems. How you dey? What've you been smoking lately? Seriously, I need some of those hashish...lol! Are you by any means trying to insinuate that OBJ is the best we've got, given that Yardua is a flat out failure?...I wouldn't want to waste a miniscule of my brain matter comtemplating this question...so, let's just move on to the next subject, puhlease! @ Nigeriapolitricks: Me smoking? Its only a serious igbo (weed) smoker that would come here and make that accusation. Especially without greeting me properly, watch yourself oh. In no way do I (or my friend) suggest that OBJ is the best at anything. Someone cracked a joke and raised an issue and I wanted to know where others stood on it. Pure and simple. Are you upset that I mentioned the debt relief success for OBJ? But it is true. No matter what you think, I have to be fair, which is why I also noted that Yardy still has 2 years to shock us with successful results. Clearly, you don't care for OBJ and that is fine. 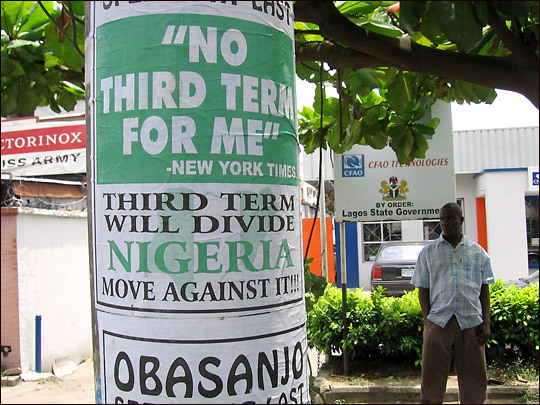 But, that doesn't change the issues that question raises such as Third term agendas not just for OBJ but other presidents and as Akin so clearly put it, whether there should even be a 'Second Term Agenda' for Yardy. Those are the issues. Anyway, its good to see you around here. I will assume that you are yet to update your blog, shebi? Come on back to blogville, my broda. Like I have said before, there are not enough political voices. We do not seem to remember that as at 2001 - two years into his first term - OBJ too was practically clueless as to what to do with the Presidency but then we must give it to him that though he had a lot stacked against him and more importantly, that he was able to appoint vibrant young men and women into the important ministries - to replace the old cargo he brought in for the first half - who turned things around for him. At least by 2001, he had given out GSM licenses and was busy junketing around the world asking for debt forgiveness. As for UMYAwn, he is in perpetual slow-mo. Even with the job practically half-done for him, he still does not seem to know what to do next. However, as I had said before now, it his prerogative. Even if he wants to spend the four years twiddling his thumbs, allow him. He is there just to fill a quota; when he finishes, he will go. And what if he refuses to go? Why do we keep limiting our options? We are asking the wrong questions. I would not rather have an OBJ 3rd term. I would not have a Yardy 1st term. I would rather have a president who is a leader and willing to do what it takes to ensure Nigeria's greatness. Simple! No go-slows, no treasury looters, no dictators, just someone who will do the job. It's not just an issue of performance, we must add the angle of precedence.Giving OBJ a third term would have set a bad precedent at the time and my take on that hasn't changed.We musn't give in to the pressure of amending things to favor a particular individual. One of America's best presidents was its first - Washington.But even though Americans literally worshiped him,he didn't give in to self perpetuation. he respected his people.And even when his successor John Adams couldn't perform like he did and didn't have the kind of stature he had, the Americans let it be.They had hope and they had faith. we could learn from that. OBJ and Yardie (that name seemed to have dissapeared), what is the difference? On whose behalf do people rule regardless of period? Leadership skills without knowledge is flawed logic. IS YAR'ADUA COMMITTED TO DEMOCRACY? IS IWU THE INEC CHAIRMAN? IS IT TIME FOR A NEW CENTRAL BANK GOVERNOR?